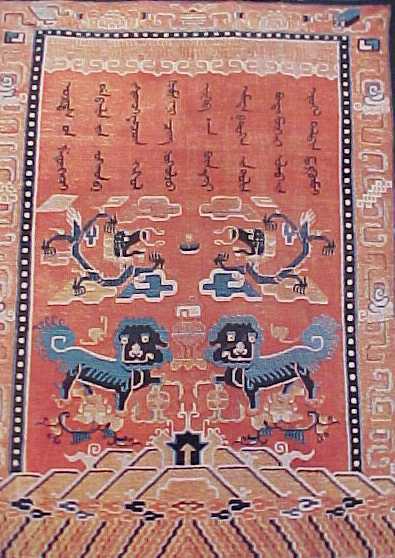 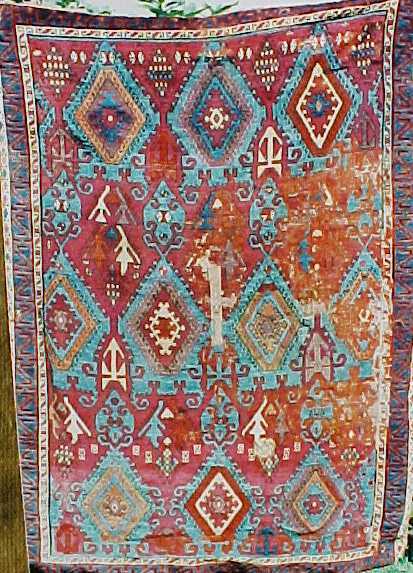 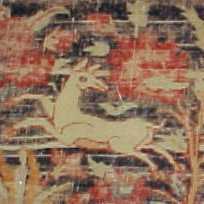 For 2500 years, from the ceremonial procession of reindeer and horses found in the Pazyryk carpet (500 BCE) to the incidental and scattered stick figures of birds and stags in modern Caucasian rugs, animals have been depicted in rugs. 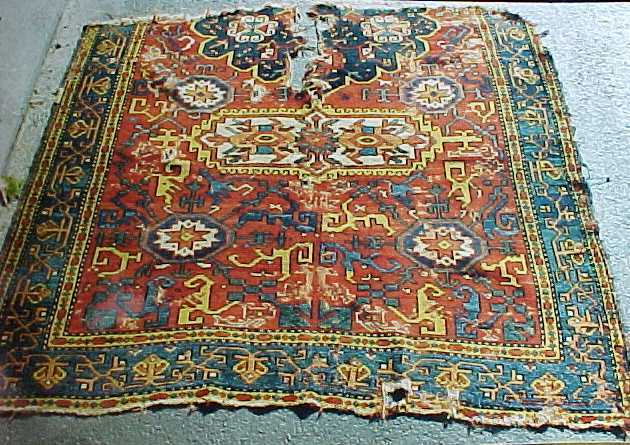 The human tendency to portray animals in art finds expression not only in th naively drawn barnyard creatures of a small village rug as well as in the precisely and elegantly rendered beasts of a Safavid or Moghul court carpet, but also in the disgusied or hidden animals commonly found in many carpets, most notably in Turkmen tribal and Turkish village rugs. 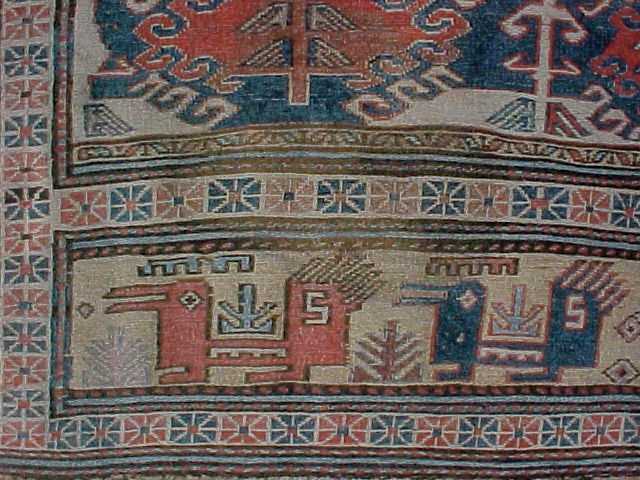 Such disguised or hidden animals may be a sign of a weaver's attempt to evade Islamic religious interdictions against the representations of animals in art. 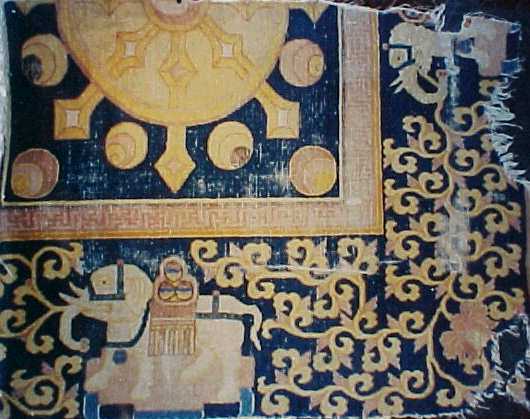 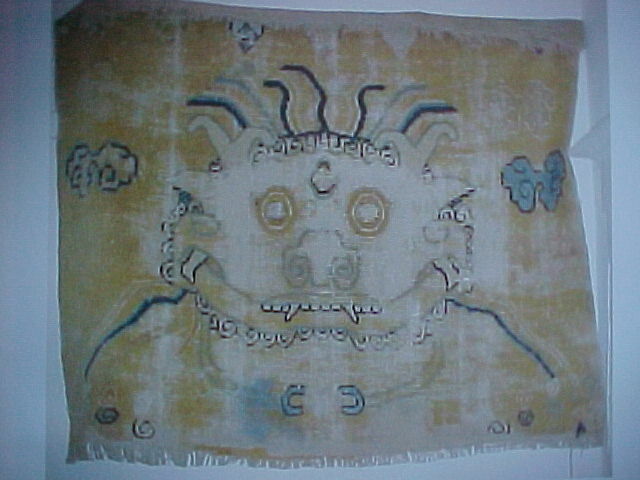 The practice may suggest the enduring influence of shamanistic animal worhip characteristic of early Central Asian religions seen prominently in Scythian art. 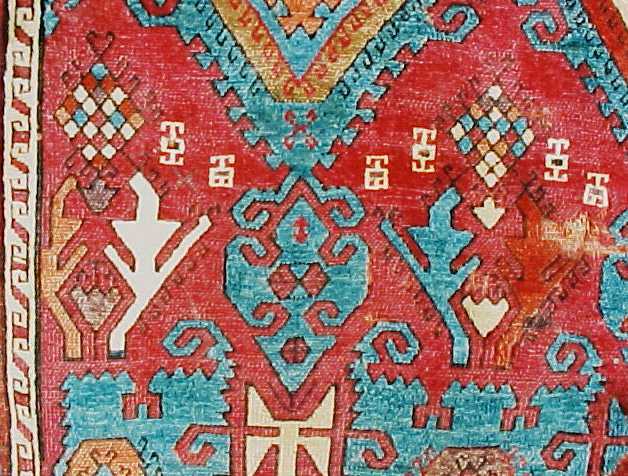 The common motif of birds flanking a tree can be seen in cryptic form in the Sarkislar rug in this exhibition. 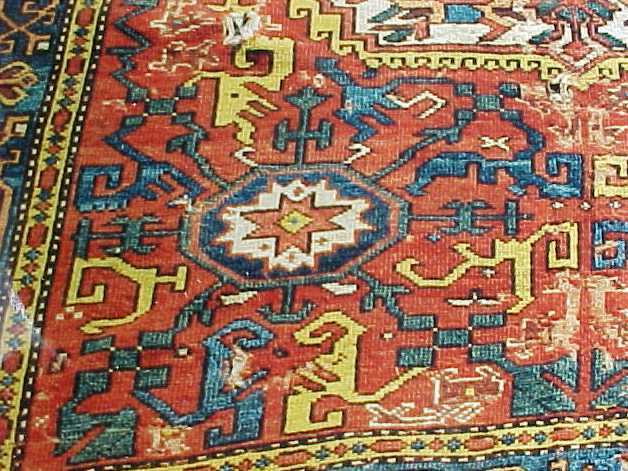 Nearly unrecognizable animal may appear in the spokes or as spokes of wheel-like medallions such as in the Belouch Khorjin and the Turkish Village rug. 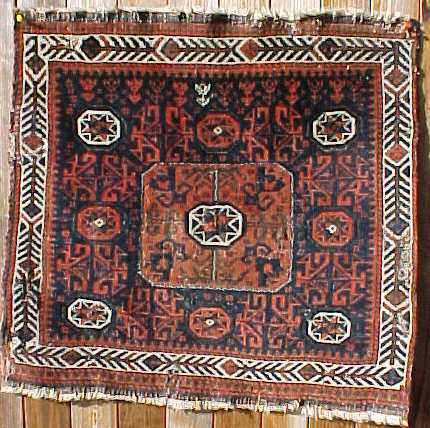 Shamanistic beliefs can also be inferred from the flayed "pelt-like" shape of the field area of many oriental rugs. 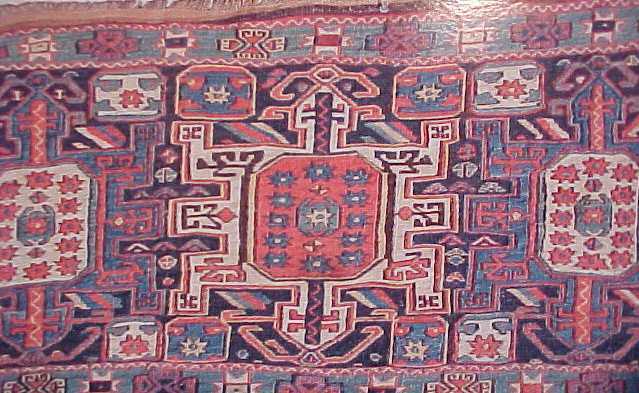 The soumak piece with the "bug" design is a representative example. 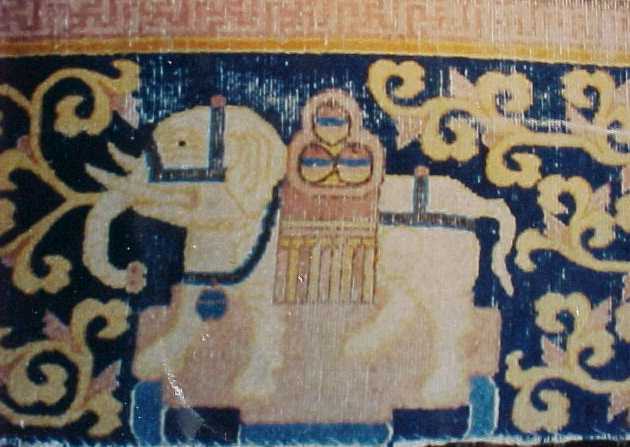 Bedding bag side panel woven in the "bug"
format decorate this small bag face. 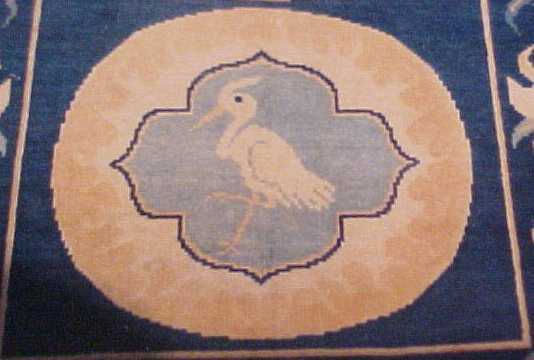 find the bodhi path for the benefit of all living creatures."